This collection contains atmospherically corrected Sentinel-2 L2A data processed by means of the DLR-PACO software. Furthermore, cloud, cloud-shadow, snow and water masks are provided which have been calculated by means of the FMask algorithm. All Sentinel-2 MSI bands are provided in 10m spatial resolution. The data encompass all Sentinel-2 granules located over Germany which were acquired from 01/2019 onwards. This is a product of the AGRO-DE project (https://agro-de.info/). The Soil Composite Mapping Processor (SCMaP) is a new approach designed to make use of per-pixel compositing to overcome the issue of limited soil exposure due to vegetation. 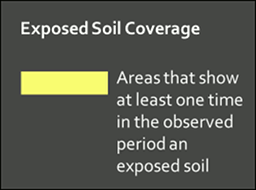 Three primary product levels are generated that will allow for a long term assessment and distribution of soils that include the distribution of exposed soils, a statistical information related to soil use and intensity and the generation of exposed soil reflectance image composites. The resulting composite maps provide useful value-added information on soils with the exposed soil reflectance composites showing high spatial coverage that correlate well with existing soil maps and the underlying geological structural regions. 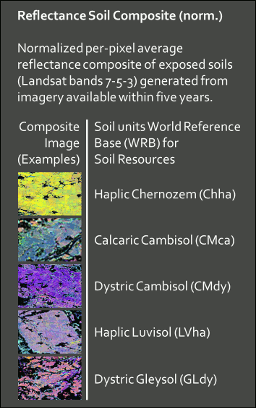 Input data: Landsat 4, 5 and 7. This collection contains Sentinel-2 Level 2B vegetation indices (VI) for all of Germany for all acquired scenes since 01/2019. VIs (EVI, HA56, NDRE, NDVI, NDWI, PSRI and REIP) are calculated from Level 2A data in 10m spatial resolution. 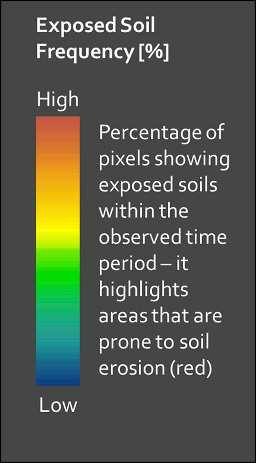 Products are available in tiles according to the ESA Sentinel-2 granule grid (UTM). This is a product of the AGRO-DE project (https://agro-de.info/).